I don’t know why. If I knew, I would probably stop. Maybe I am just doing it to be able to know why I am doing it. It is probably not as silly as it sounds, in fact. Now, that’s the case 9 times out of 10, but this time, for my 10th Ironman, I know why. I know why I am back to Australia 6 weeks after finishing Ironman Melbourne, toeing the line of yet another Ironman, this time in Port Macquarie. I am here because I need redemption, because I deeply disappointed myself in Melbourne and found it hard to live with that burden on my shoulders for months or years. I had to do something about it, and do it quickly. To me, when I reflect on what happened in Melbourne, I was weak. I got carried away by the jitters in my mind, ran scared, desperate and did not put on enough of a good fight. I see myself as a fighter, and that day, I was the shadow of myself. Months and months of training become useless if the mind does not believe in success on race day. And then there is that second trace in my mind that I hadn’t managed to eradicate. The only race I didn’t finish was Ironman Port Macquarie 2010. I had very good reasons to give up, as this ‘DNF’ (Did Not Finish’) was just the first symptom of a much greater evil that consumed me for months after that, a general meltdown, a burnout, a depression. Whatever you call it, it put me on my knees, and starting the race that year was probably a proof of extreme stubbornness and total lack of clairvoyance: I was bound to fail that day. Once time for the marathon comes, if you’re not in peace within yourself, you get crushed, without mercy. There is nowhere to hide, nobody to help you, no excuse good enough to make the pain and doubt somewhat less painful. And crushed I got, giving back my chip after running only 4k that day. It was brutal, a terrible blow. I realized that Port Macquarie 2015 would give me a double redemption: the immediate rebound I needed from Melbourne 2015 and the long overdue finish line crossing of the only race I did not finish 5 years before. So here we go again, in a mindset completely different from 6 weeks ago, probably not quite as fit as in Melbourne, but a bit more rested as I did very few super long and hard sessions between both races. Of course I am here to get a slot for the Kona World Championship, on top of the double redemption, but I focus on thinking that if I deliver the good fight I am capable of, Kona should come with it. Torrential rains have washed away the shore in the last 2-3 days. The news kept talking about storm and typhoon and I tried not to be affected by this background noise. I decided to suspend or shorten most training sessions as the conditions were so bad that just stepping out of the hotel was a recipe for disaster, with the rain and wind. As a result, on race day, the swim provides two little surprises. PMQ is one of the races that first experimented the ‘rolling start’. It was already the case last year. Swimmers seed themselves and start by mini-groups of 6-7 every 5-6” seconds. No more mass start. This was implemented because statistics show that most lethal accidents in triathlon occur during the swim portion. I love mass start, it’s messy, scary and beautiful to watch, but this new start procedure definitely reduces risk and provides a better experience to the athlete. I know I normally finish in the top 50-60 age groupers in the swim in Australia so I seed myself at the front, not in the front line but not far. The swim starts easy. I fact, it does not take long before I worry about going too slow, so I immediately start paying close attention to who is around me. I find out that nobody passes me and we seem to all keep that nice little pace. It is going to be a long day so even if I were to be two minutes slower than usually, it should not matter in the end, and a relaxing and easy swim is better on the long run (no pun intended, although this one is really appropriate!). At the first turn-around buoy, I know we are reaching 1k and I decide to focus on my glide. I roll more on the sides, reach further in front, take longer breath, stretch, undulate slightly, it feels great. I also realize that I am doing something really stupid: I watch in front every two strokes. The water is so murky that I don’t even see the feet of the guy in front of me. I usually sight every 10-12 strokes, confident that the bubbles from the feet in front of me indicate me the way. Not today, but it is not a reason to sight that often, so I switch to sighting every 6 strokes, still more energy consuming that every 10, but better than every two. The swim is not monotonous at all as we swim around beautiful sailboats and along superb villas. It is a one-loop affair, which I think is different from 2010. We have to get out of the water twice to climb a ramp set up to go over some kind of bridge, which also breaks the monotony. Finally, we exit at a place different from the start, so all this unusual set-up keeps me entertained. Before I know it, I’m under the swim finish arch, in 53’. My personal best is 52’, also in PMQ, but I’m more a 55’ guy, as was the case in Melbourne, so it’s quite satisfying to swim that fast so easily. Turned out that it was the XXth split including pros, not bad for me, not bad at all. As usual I manage to waste something like 30-45” in transition over my competition, but I am convinced that not sprinting out of the water and not rushing in T1 is the right thing to do in Ironman. Once on the bike, I start conservatively. I remember being passed by ‘airplanes’ in the first kilometres of the bike course in 2010 and I notice that athletes around me are more cautious this year, or maybe I am stronger. The bike course is a very interesting one. It starts with 13-14k of undulating hills (although some of these bumps request me to use the easiest gears I can find, so not sure I should call them undulating) and then it goes along beaches, through forests and woods, over bridges and through small towns, it is scenic and keeps changing. We are far from Melbourne’s boring but super fast bike course, especially given that the road surface in PMQ is not good. The Shimano mechanic at the Expo recommended me to inflate my tubulars at 110psi, much less than what they can take, to help dampen the vibrations, and he was right. It’s as vibrating as in Busselton, if not more. My good old Cervelo P3 is probably living his last Ironman as my bike fitter/bike mechanic/bike wonderguy Tony Pringle in HKG managed to prolongate its life one more time with magic tricks, but I wouldn’t want to race long again on such an overused machine. Anyway, it is good enough to maintain me at a decent speed, but around 40-50k I get passed by two ‘trains’ of cyclists. I hate these situations. Riders separated by 12m, as the rule says, do not cheat, but they do benefit from ‘legal’ drafting. So when groups pass me, I am always torn between the idea of ‘getting onto the train’, riding faster but toying with the 12m rule, with the risk of inadvertently infringing the rule here and there and get a time penalty, and letting the trains pass by and never see them again. The truth is: in these trains are over 90% of the future Kona qualifiers, the majority of which are no cheaters, as they just play by the rules, enjoying the little drafting effect that riding at 12-14m can provide. But I have my heavy history in PMQ, as I got a penalty in 2010 although I am still convinced, 5 years after, that I was riding legal. So I let the train pass. And another one. And another one. Results show that I lost 30 places during the bike leg, and most probably happened with these 3 trains. There is a bit of headwind as riding at 33kph does not feel as easy as it should, but the tailwind does not make me ride at 40kph either…not sure why. In fact, I don’t think I have been fast at any point of time in this course, either because of wind, road surface or the so-called rolling hills. As a result, using a disk wheel was probably a mistake, as its efficiency really becomes obvious at high speeds that I barely ever reached. It’s just that I remembered that during the 2010 race, there were definitely more disks than this year, although the course was overall hillier back then. After 76-77k we hit the rolling hills again, but apart from ‘THE’ hill 10k before hitting town, it is actually easy to maintain good momentum in that direction. The short period in the city is always fun, with brash individual supporters and insane club supporters wearing the most delirious disguises. Back to the rolling hills the hard way… ouch, it seems that my morale gets hits by a truck, not sure why, I didn’t see it coming, but it’s bad. Not even 4h into the race and I feel flat… But with old age comes experience and I know that this is just the first wave of a long series and that tsunamis do occur on Ironman courses even with very flat water conditions. I use my new trick which is: pranayama, yogic breathing. I try to shut my mouth and breathe only through the nose, I make sure I breath from the belly, I concentrate on the tip on my nose, and within a minute or two I’m back into the game. Worked in training, works in racing ! After the turnaround of the second loop I notice that I start picking up guys. I am myself far from feeling fresh, but I reach the mental barrier where I know that within 1h30+, the bike portion will be over. 1h30 is nothing, right ? I am looking forward to reaching the final hills, but before that, there are lesser hills to climb. I switch more and more often to the small chainring… I know I am getting slower, significantly, but there is nothing I can do. At the same time, I pick up more guys… good good good. The last hills do not feel too bad and before I know it, I reach T2. 5h26, that’s not fast, but I know that on that course, with my swim split, I’m still in contention for a Kona slot, provided I run well. I would have preferred to ride 5h20 as my analysis from last year results showed that it probably what was needed to be near the lead, but I just couldn’t. Ooops, daydreaming again, I forcefully draw my attention back into the race. I start the run relatively well. Two guys in my AG pass me but I pass them back little after. The encouragement from the crowd do not lie: “I look good !”. After 20 years of racing, I know how to read the comments from the crowd. There is a difference between the “looking good, way to go” that supporters repeat like machines for 4-5h standing by the side of the run and the “waouh, look at this one, he looks strong”, and at that moment, it’s more like the second option. I am running 4’40/k average and I am in line with my target, so it feels good. At some point I catch up with Pete Jacob, 2012 Kona World Champion, who is strolling at a pace similar to mine, discussing with another pro. I can’t help but telling him: “hey Pete, can you stop chatting and at least pretend it’s hard for you too”, as I struggle to maintain my pace in their shadow. Oddly enough, I end up passing them as they both have a terrible day. The run is made of 4 loops, on varied terrains, with again different sceneries to look at, different atmospheres, a hill, all in all a rather interesting course, just like the bike part. After one loop or 10k, I’m still on 4’40-4’45 pace. My mind uses a moment of weakness to start playing his usual tricks: ‘man, you’re Kona material, maybe even podium material, you only saw two guys in your AG in front of you, can you imagine, a podium at an IM in Australia’… and so on and so on. Nonsense ! There is a T-shirt cyclists and runners wear with pride that says ‘shut up legs !’. I think I’m going to create my own T-shirt that will say ‘shut up, mind !’, that would be more appropriate. All in all it’s not going too bad. I do slow down to 5’ pace on the second loop, but I notice that I am in ‘Kona mode’. Kona mode is the way I run when I know I can qualify. The body is hurting like hell, the stride is too short, the back is stiff, my shoulders are hunched, but I’m on a mission, I am fully in sync with my body, I am a machine, a rusty weary one, but still functional, and more importantly, not deviating from the final destination. Third loop, hummmh, 5’15, 5’17 pace, nothing I can do, nutrition is OK, hydration is OK, cooling strategy works, what can I do to get faster ? I really don’t know where I am in the race, with the rolling start, everybody has a different start time, I don’t know if there are guys that start at different times close to me. What I know is that if someone comes from behind and passes me, it is going to be really ugly as my batteries are flat. OK, mind on a leash again please, focus on what is, here and now. I knew there was another French athlete living in Asia, friend of a friend, and I recognise his team t-shirt when he passes me. We exchange a few words. Feels bloody good at this stage of the race. We run a bit together but we have different paces. He runs faster but slows down more at the end station. Eventually he passes me for good. Doesn’t matter, one more loop to go… I lap tons of people, double lap, triple lap, but that does not do me anything, I am more alone than if I were running on my own in the dark. Pain, pain, pain, I want to go faster…’leave nothing in the tank, put everything you have, but don’t blow it up now’… I am like a funambulist, that’s probably the best metaphor, walking a very fine thread. I push to my limit, I need to go faster, I need to catch up guys, I need to make sure nobody is catching up on me, but if I happen to run 5 seconds per k too fast, I might blow up, walk and fall flat to the ground, losing everything I have built for 9h15. I’m running scared, my strides shortens further… faster, faster… arghh I can’t, still 5’18/k… hurts… shut up mind… check: shoulders: tense, relax them; stride: too tight; glutes: not working enough, fire them… 5’/k, it works. Oh man, 4k to go, it’s time to unleash the monster… but there is nothing left, back to 5’15+/k… no complacency Olivier, you must not regret anything. 40k, can’t go faster, nothing I can do. Finally the finish line, 9h57, sub 10h, that’s the best I can get. 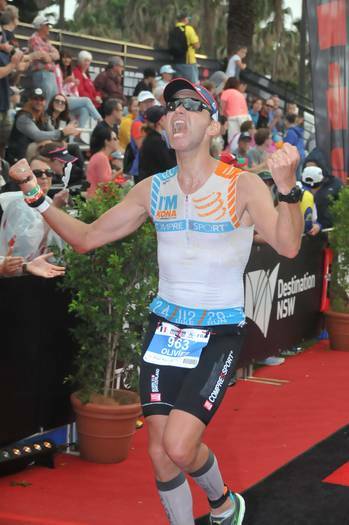 I gave everything I had, now Kona or not, I have healed my wounds, DNF and Melbourne frustration erased all at once. I ended up 7th in my AG, 3’ shy of a Kona slot. Hard to digest ? Sure it is. But it is not the most important. The race is just a day, at the end of a 5 months journey that started a bit before Christmas and during which so many great things occurred. And it is also the day before the beginning of a new phase, a phase of reflection, of redefinition of goals and priorities. A slice of life ends, a new one starts, and it’s all good as it is. Man, I love this sport !